Imagine yourself lying in a hammock of a warm, fragrant exotic garden in ancient Persia (modern day Iran & Afghanistan. The flowers lying amid you are vanilla, fruits, and others indicative of a Persian garden to ensure a light and it is an irresistible fragrance. Such a scent is pomegranate, orange and davana. Weleda captures this in a scent. It is 94% organic. Hand-crafted by Weleda's in-house perfumery. This captivating fragrance is free form phtatlates or any synthetic chemicals. I love this exotic, alluring, scent. It is enduring to the heart and to the soul. Wearing Weleda's long-lasting natural scents is a fresh departure from chemical laden formulas. They are definitely worth trying out. Give yourself a push today and try something different, seperate from the pack. 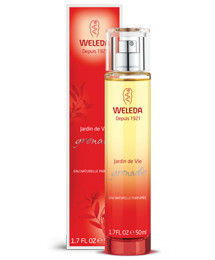 Weleda Jardin de Vie grenade is purchased online at www.weleda.com. Or at many stores, most of which are natural food store or boutiques specializing in natural skincare. Like Weleda on Facebook: https://www.facebook.com/Weleda.NA/?brand_redir=198119003432; Follow Weleda on Twitter: @Weleda; Follow Weleda on Pinterest: https://www.pinterest.com/weleda; Follow Weleda on Instagram: https://www.instagram.com/weleda_usa; Subscribe to Weleda on YouTube: https://www.youtube.com/user/WeledaNorthAmerica; Follow Weleda on Google+: https://plus.google.com/105899325370412648369.